Intensive talks are under way between high street giant Boots and rival Alliance UniChem to finalise a £7bn (10bn euros) merger deal. The deal, which could be announced as early as Monday, would create one of Europe's largest drugs, beauty and healthcare products retailers. The BBC's business editor, Jeff Randall, said the talks may be a "make or break" moment for Boots' future. Boots has struggled in the face of stiff competition from Tesco and Asda. The famous high street name, established in 1849, has seen its sales eroded in recent years as supermarkets have aggressively targeted the toiletries and over-the-counter medicines markets. Neither Boots nor Alliance UniChem have commented on the reported merger talks, said to have been going on for several months. The BBC's business editor said a merger of the two firms would create a "retail giant". 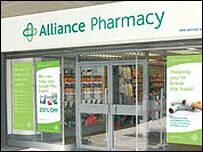 The combined company - set to be called Alliance Boots - would own 2,600 stores in the UK and continental Europe. 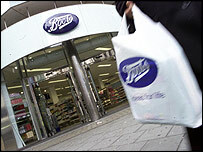 Boots currently owns 1,400 pharmacies in the UK and has a stock market value of £4.4bn. Alliance UniChem operates 1,200 pharmacies in the UK, Norway, Italy, Switzerland and the Netherlands and has a market value of £3.15bn. According to newspaper reports, all Alliance UniChem's retail outlets would be rebranded as Boots in the event of a deal. A tie-up would give the Boots brand greater profile in continental Europe as well as creating a major global force in the distribution of pharmaceutical and healthcare products. Any proposed deal is likely to be scrutinised by the UK competition authorities, which may require the merged company to sell some stores. The two companies are expected to argue that the deal would be good news for consumers as it will lead to lower prices. The Observer reported that a merger could result in thousands of jobs losses as the two companies tried to make savings in areas such as administration and distribution. 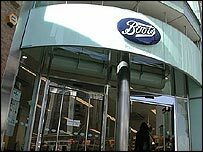 If the deal goes ahead, Boots' headquarters is likely to switch to London from Nottingham, where it has been based all its history. "There is a little bit of sadness (that the headquarters) may move but people are realistic," Dr Nick Palmer, Labour MP for Broxtowe - where Boots' head office is based - told the Sunday Telegraph. "They want Boots to be successful." Investors have become increasingly dissatisfied with Boots' performance over the past 18 months, during which it has issued three profits warnings. Its profits fell 11% last year and it recently warned of "difficult" trading for the rest of the current year. Boots' efforts to broaden its retail offering over the last ten years - offering dentistry, chiropody and laser eye surgery - have proved largely unsuccessful. Alliance UniChem has grown steadily through acquisition to become the third largest pharmacy chain in Europe. The original business was founded in the 1970s by Stefano Pessina who remains executive deputy chairman and owns 32% of the business. Conservative MP Kenneth Clarke is also a director of Alliance UniChem. It was reported that he could become a director of the combined company unless he becomes Conservative Party leader later this year.